Alright, the cultists have gathered. The skies are open. The stars are aligned. The chanting has begun. You're about to be summoned for the very first time in like thousands of generations. You're nervous. You've got to look the part: terrifying, horrific, an alien fear beyond mortal imagining. But, you also want them to like you! What is an Eldritch Horror supposed to do? You can't just show up, eat all the cultists, and head back in for a nap. That's what you did last time and look at how long you've waited! No. You've got to put a new face on this time. 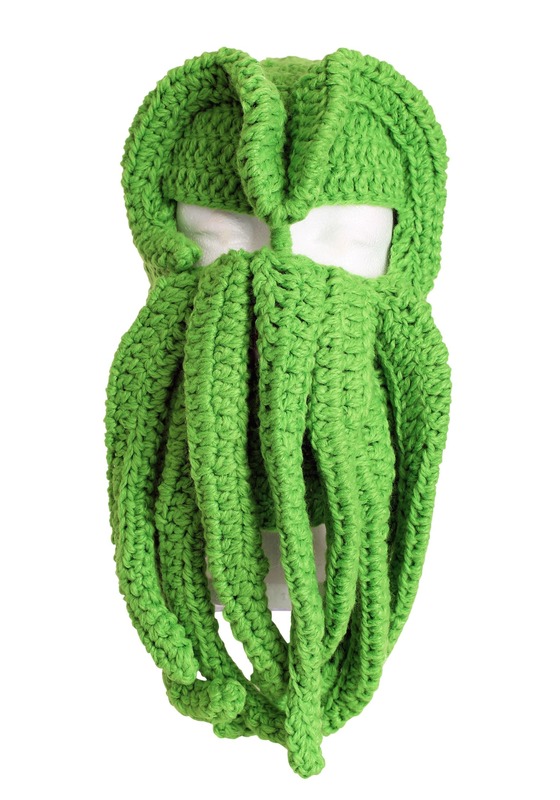 Show the world a softer side to your immortal, horrific, endlessness with this Cthulhu Ski Mask. You'll have all the deep and unknowable horror of your wide eyes and dangling face tentacles... but in a knitted yarn form. Comfy, warm face makes for a delightful Elder God guest! Once the last fhtagn has been uttered and the gates to Oblivion open, you'll be able to step out of R'lyeh with a giant smile and open arms. Granted, they won't see the smile through the tentacles on this Ski Mask but everyone will be able to feel it, we're sure! Just remember: only eat some of the cultists, this time!